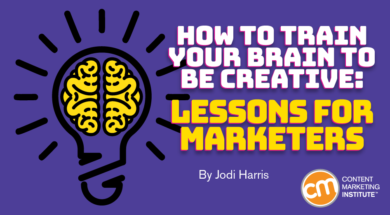 For many years, I worked alongside a talented content marketer who often insisted she just wasn’t “a creative person.” Though there was plenty of evidence to the contrary (I won’t embarrass her by sharing details), she refused to believe her brain was capable of generating big, innovative ideas or turning them into groundbreaking storytelling. Rather than argue with her, I thought I’d prove her – and, by extension, any other marketer who thinks crafting imaginative, one-of-a-kind content is a task best left to “artistic types” – wrong once and for all. To do this, I gathered compelling evidence, perspectives, and advice from some of the most imaginative, inspirational, and downright impressive minds in the world of creative content pursuits. Beyond the critical role it plays in tech innovation, personal self-expression, product development, and simply making our world a more interesting place, creativity may be the most important determining factor in whether a content marketing program is properly positioned to thrive or doomed to fail. Standing out from your competition. When cutting through the noise in a crowded space, take a lesson from notable marketing vloggers Andrew and Pete: Believing that “playing follow the leader will keep you always in a state of being one step behind,” the duo infused advice-filled videos with their signature quirky charm and forged an award-winning niche for themselves in the process. Scaling your reach and influence. No single marketing approach will work forever or for everybody. If you want to bring new folks around to your way of thinking – and get them to share it with their friends – have a range of creative broad strokes to entice them. Overcoming attention fatigue: Over time, even your most popular content pieces can get overshadowed by the shiny things hitting your subscribers’ news feeds and inboxes. Delivering something unexpected can shake loose the cobwebs and reignite the passion they felt when they first signed on to engage with your business. Reenergizing your content team. It can be hard for content creators to stay focused and motivated when they are producing the same content pieces over and over. Giving them the time and space to explore new ideas can strengthen their sense of ownership over their work – and their job satisfaction. Following this theory, anybody (including my former colleague) can learn to be more creative if they so desire. Of course, it’s going to take some work; but it’s a lot easier if you know how to get yourself into the right frame(s) of mind first. Open mode – Your mind is relaxed, expansive, contemplative, inclined to humor, and playful, which allows natural creativity to surface. Closed mode – Your mind is still active, yet its function is more purposeful and focused. It’s where you organize your ideas and decide how to implement them in a meaningful way. Of course, when you’re talking about creativity from a content marketer’s perspective, you don’t often have the luxury of cultivating the ideal mindset before getting something down on the page. After all, you have deadlines to meet, business goals to reach, and eager subscribers you can’t disappoint just because your creative muse doesn’t have a safe space in which to work her magic. In fact, if you ask Unthinkable Media’s Jay Acunzo, the whole idea of expecting to be visited by a mythical spirit doling out creative inspiration is a bigger fallacy than the existence of unicorns (which, as we all know, live in abundance in a magical land called Silicon Valley). The muse is an excuse: In his recent webinar on improving creativity in content marketing, Jay calls BS on the whole idea of invoking an ephemeral spirit to catalyze creativity. As he sees it, the idea of an artistic muse is nothing more than an excuse that allows creative types to absolve themselves of culpability when ideas don’t pan out – or don’t pour forth at all. Fortunately, Jay believes that once you stop approaching creative endeavors as a product of divine intervention, you can make them happen in a more reliable and constructive way. And, as with Mr. Cleese’s recommendations, it all starts with a simple mental switch. Similarly, Jay characterizes creativity as a lifetime of small, deliberate motions; not a single, monumental shift. He encourages aspiring innovators to approach creative endeavors by building a manageable process around producing them. Side projects: Carve out a bit of your own free time to build a single idea; but make sure to work consistently as long as it takes to see it to completion. Side pockets: If your company allows for “10% time” projects (like Google and Coca-Cola have reportedly done), find a small pocket in this allocation to put your creative energies to practical use. Extractions: Identify a creative effort you admire and deconstruct it to learn what “made it tick.” Once you discover its mechanisms, look for ways to apply what you’ve learned to your content initiatives. Share your ideas with your team, using the original example as proof of its potential to succeed. “Up the mountain, down the mountain:” If your goal is to write a book, test a single idea in a smaller format, like a tweet. If you get traction, look for a way to incrementally expand it into a larger piece, like a blog post. Continue to build toward your goal, testing your idea’s resonance as you go along. Once you have achieved your intended purpose, go back “down the mountain” to distribute it using the same channels and formats you leveraged in its development. While the right framework can help you nurture your inner innovator, visionary marketers may encounter plenty of other challenges on the path to greater content creativity. Here are a few examples, along with some helpful suggestions for conquering them. In her recent post on generating content ideas, Carla Johnson contends it’s often not our ideas that fail to win stakeholder support, but rather how we’ve been conditioned to pitch untested ideas. Start with an observation. This will provide a practical context and help stakeholders understand the inspiration behind your idea. Distill the observation’s essence. Next, distill the broader meaning you observed. Bring the big theme anyone can relate to, which demonstrates your understanding of and empathy for the situation. Relate it to your brand. Connect the dots between your observation and its relevance for your business, which will help provide the necessary aha moment around your creative idea. Explain your idea generation. When you preface the explanation of how you generated your idea with the observation, distillation, and relation to your brand, hone in on why your observation matters ­– and how it has an opportunity to create value for your organization. On the other hand, sometimes it can be better to beg forgiveness later rather than ask for permission first. For example, if you let yourself get too caught up in ideation and explanation, you might run out of creative steam before your content ideas can take shape. This can lead to the total productivity killer known as procrastination – where you delay the creative process because you simply aren’t sure where or how to get it started. While this is a question that seems to pop up in just about every discussion on content creativity, Jay thinks it’s time to shut the door on this question – which he views as a false, misleading choice – once and for all. “When management asks for quantity, give them results that demonstrate the value of quality,” he advises. If you are looking for more answers to your big questions on creativity and content, I highly encourage you to watch Jay’s Ask Me Anything webinar on creativity. In the meantime, I’d love to hear from you: What inspires you to think outside the box when you face a content marketing challenge? What holds you back from pursuing innovative ideas? Please share your thoughts in the comments. Hear from inspiring creators like Jay Acunzo, Andrew & Pete, and Tina Fey in person at Content Marketing World Sept. 4-7 in Cleveland, Ohio. Register today and use code BLOG100 to save $100.